XAMPP is a developmental server used by many techies. This popularity stems from its effectiveness and simplicity. However, it comes with its fair share of bugs. One of the most reported case is the error message apache shutdown unexpectedly. At first glance, the obvious guess would be that the error message is caused by a program or application already using the active port. There are two ways to go about resolving the above problem. 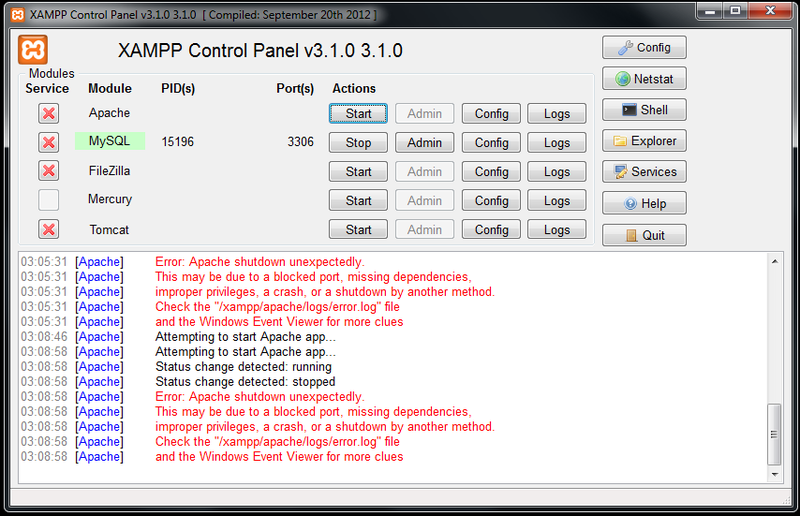 Go to the XAMPP control panel and click on Apache configuration button. It is under the button labeled “logs”. Choose ‘Apache (httpd.comf)’ from the resulting drop down menu. Notepad opens up. Press Ctrl + F so as to find the default port number. Change it from Listen 80 to the new port that you prefer (or, as above, Listen 7777). Apache should be running seamlessly now. Stop the service or application that is making use of the 80 port. Go to Tools – Options – Advanced – Connection. Close Skype (or the program that you identified using the 80 port). You are sorted. if you still facing same problem or if you have any other working solution feel free comment below or submit your article.